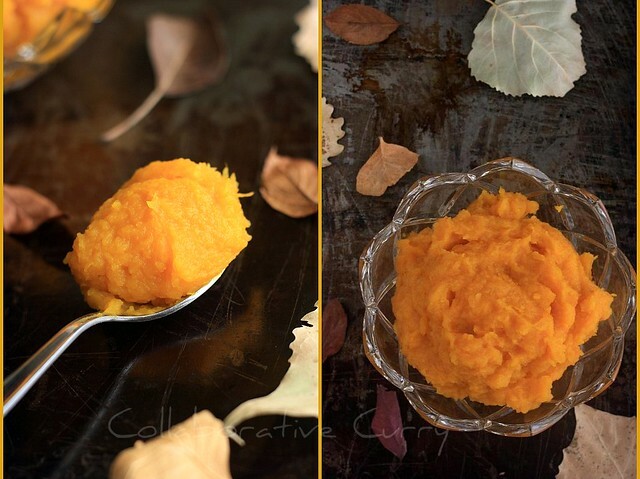 Collaborative Curry: Pumpkin Puree and Happy Thanksgiving ! 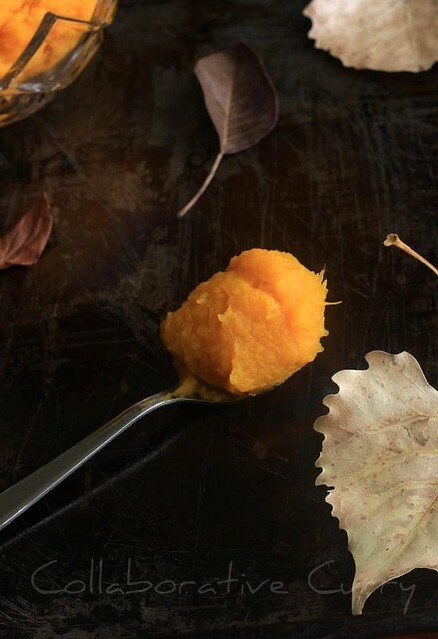 Pumpkin Puree and Happy Thanksgiving ! Hope everyone is doing great and getting into the holiday mood.The shops are already full of X'mas decors and holiday goodies. Those who are in US will be planning and preparing for Thanksgiving,which will be on this Thursday.I would love to hear about your menu plans. Are you planning an Indian spread or a traditional feast or a mixture of both ? Every year I make a pie for Thanksgiving, and last year I told you that I would like to try and make pumpkin puree at home, for my pie. Here I am., though a bit late, to keep my promise and share my story of pureeing pumpkin at home. I am planning to bake a pie with this and with the left overs, a pumpkin bread and some other goodies.Just by the look of this puree I can tell you this much : I will never ever buy canned pumpkin puree from a store any more ! Wish you all a wonderful Thanksgiving day, with your loved ones and friends,filled with lot of love and laughter ! Hope you will savor lots of good food and have lots of fun ! Have a great holiday season folks ! 1.Preheat the oven at 375 degree F.
2.Wash and dry the pumpkin you are going to puree. 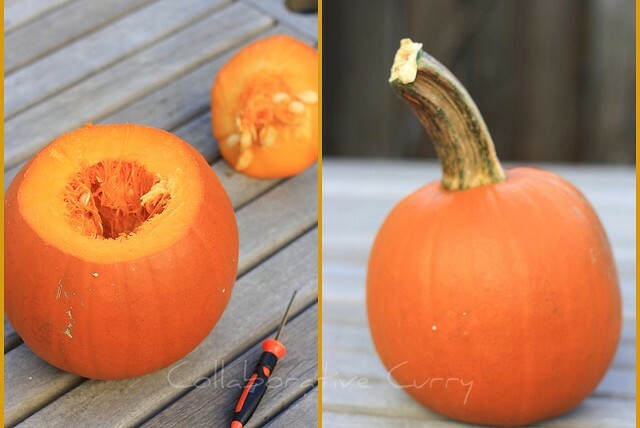 3.Remove the top/the stem part using a sharp knife or preferably a saw.Scrape out the inside and seeds. 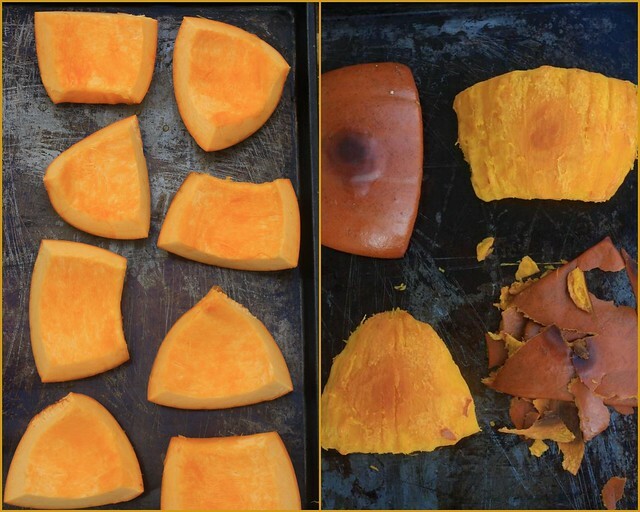 4.Cut the pumpkin into 4 equal halves and then cut each part into halves. 6.Peel off the skin and save the flesh. 7.Puree the flesh using a food processor.Add a spoon of water if necessary. 8.Store in ziploc bags in the freezer, if you are planning to use later.Otherwise store in an airtight container in the fridge. 1.I have read in some places about spraying the pumpkin with olive oil. I didn't do that. 2.I did not add any water wile pureeing, since I wanted to have thick puree. 3.If you think that the puree is too watery, just seive to get thicker puree. Never tried making a puree - it always seems like too much work !! But am sure the pumpkin pie with fresh puree would taste awesome. Happy Thanksgiving, pumpkin puree looks wonderful. Happy Thanksgiving to you too Nami.. We are planning for a whole chicken instead of turkey - Indianised Thanksgiving.. Happy Thanksgiving to you too! We are going for a potluck dinner at a friends place and also having a few folks over for a lunch too! :) So excited! never tried dessert with pumpkin. looks very creamy. So i am all for bought ones. The fact that we get it here only in wholefoods makes it a bit inconvenient, but since its a once a yr thing, I dont mind. I am yet 2 get my hands around a pumpkin pie, maybe next year. never tried making a pumpkin puree be4..looks gr8...happy thanksgiving ! Lovely shots! this is truly indianish a dish! First time here...I also make homemade pumpkin puree for pumpkin based desserts, but i just boil the pumpkins with a tiny bit of water and mash it up. I have a Pumpkin cupcake recipe on my blog if you'd like to see. Love this blog. Will be following you from now. Puree is kewl. Pumpkin pie whoa that is interesring nami. Post the pics soon. Hope you had a lovely thanksgiving.